Certified HeartMath Practitioner and Naturopathic Doctor, Dr. Laura M. Brown, ND explains how the heart and brain communicate and how the activity of the heart influences our perceptions, emotions, intuition and health. How does the heart communicate? The pulse is measured in beats per minute. A normal adult resting heart rate is 60-90 beats per minute. The heart rate is slower in athletes, hypothyroidism, and when taking medications like a beta-blocker. Blood pressure. The top number is the systolic pressure, which is the force the blood pushes on the arteries as it squeezes through. Generally 120mmHg or less is considered healthy. The bottom number in your reading is the diastolic pressure. Diastolic pressure is the force the blood acts on the arteries when the heart is filling with blood. Around 80mmHg is a good number. A visit to your doctor will help you understand how often you should test and what your numbers mean if they are not around 120/80mmHg. Electrocardiogram or EKG measures the electrical impulse that causes the heart to pump blood. Sometimes people get a pacemaker if the natural electrical system is not working properly. The heart is hormonal. Two well known hormones are atrial natriuretic factor (ANF), brain natriuretic peptide (BNP). ANF and BNP are activated by increased wall stretch due to increased volume and pressure overload – they rise sharply right after a heart attack and can be monitored as an indicator of cardiovascular disease. Heart rate variability (HRV), or the beat to beat variation of the heart rhythms are the clearest indicator of one’s emotional states, level of stress and cognitive processes. It is also the most consistent measure of cardiovascular health. The 1994 Framingham Heart Study identified increased Heart Rate Variability (HRV) as the only common factor that was found in all healthy individuals. From the mind and heart of Dr. Laura M. Brown, ND. Sleep and rest well. Quality sleep makes for effective exercise, and helps ensure that you have the mental gusto to show up. Cultivate a healthy sleep schedule, and stick to routine sleep and waking times as often as you can. Whether you’re just getting started or just want to lose those last 10 pounds, scroll through these little changes that can have a big impact! Making a sandwich? 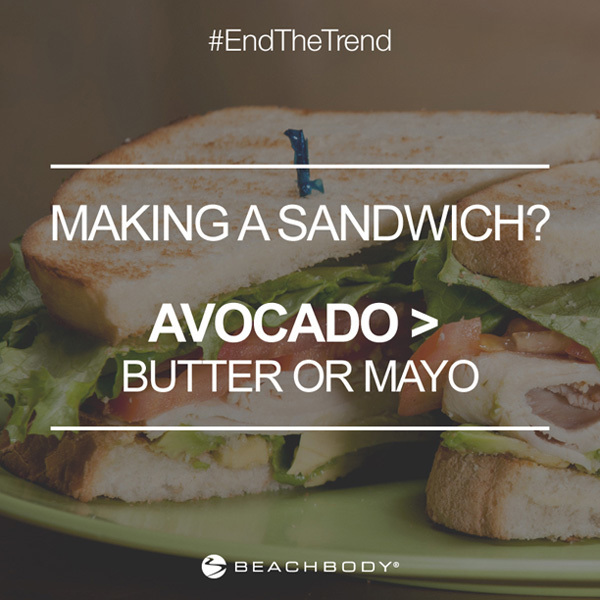 Avocado > butter or mayo. It’s full of healthy monounsaturated fat and fiber and contains more nutrients than those other two. 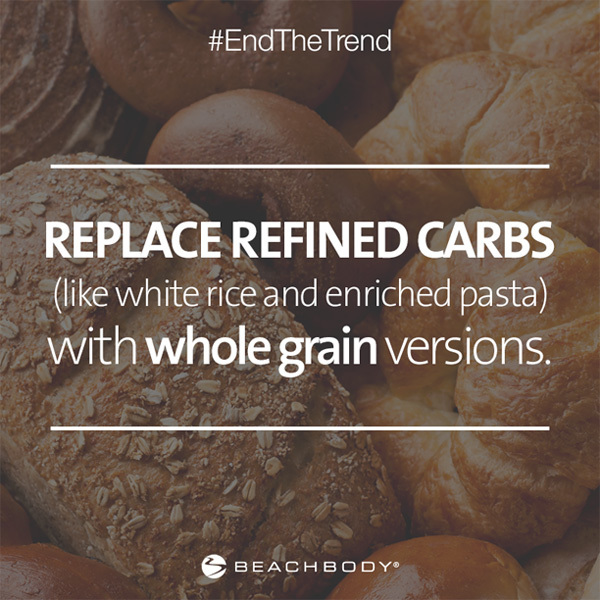 Replace refined carbs (like white rice or enriched pasta) with whole grain versions. Whole grains have more fiber and more nutrients and absorb slower. The result is they won’t spike your blood sugar and will provide you with longer-lasting energy. 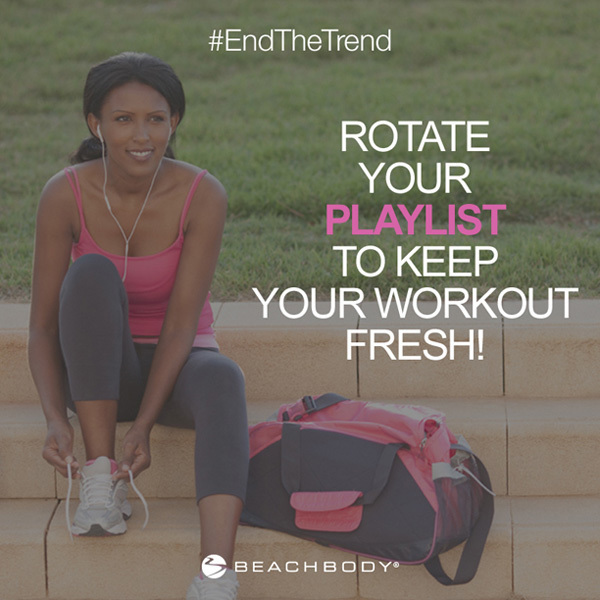 Rotate your playlist to keep your workout feeling fresh. And, while we love our trainers, if you need an extra push, don’t hesitate to put on your own soundtrack. 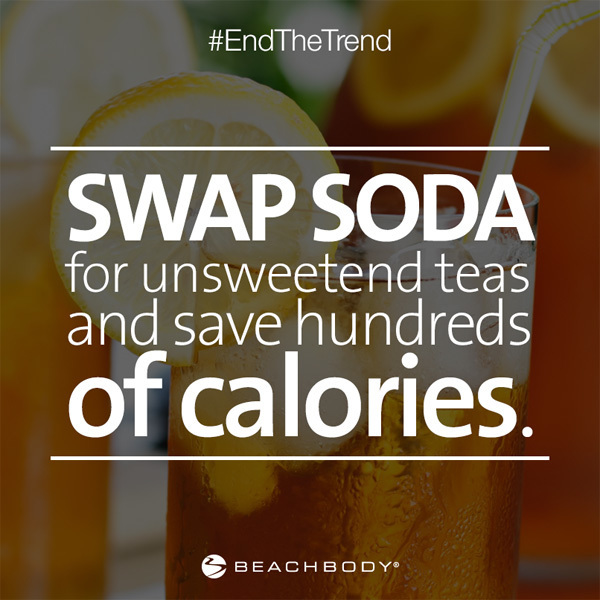 Swap soda with unsweetened, preferably fresh-brewed, iced tea. You’ll save hundreds of calories and won’t be drinking nasty chemicals. Just make sure not to drink “diet” tea or tea with weird preservatives or other chemicals. Watching TV? 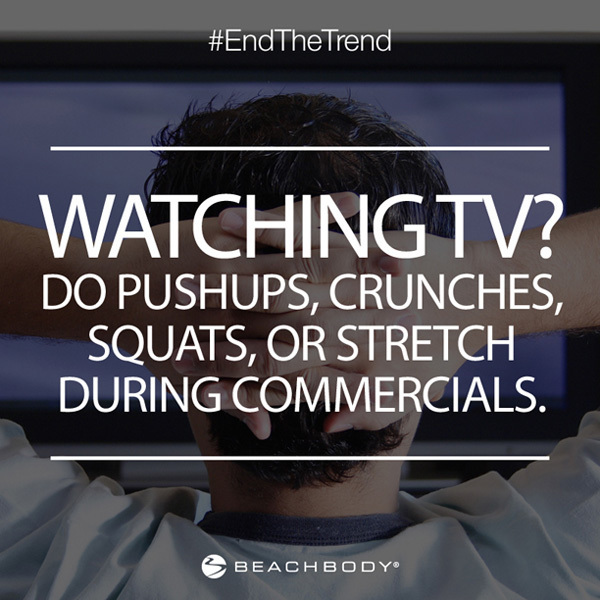 Do push-ups, crunches, squats, or stretch during commercials. You’ll burn extra calories, keep your brain active, and spend less time sitting (which is really bad for you in long stretches). 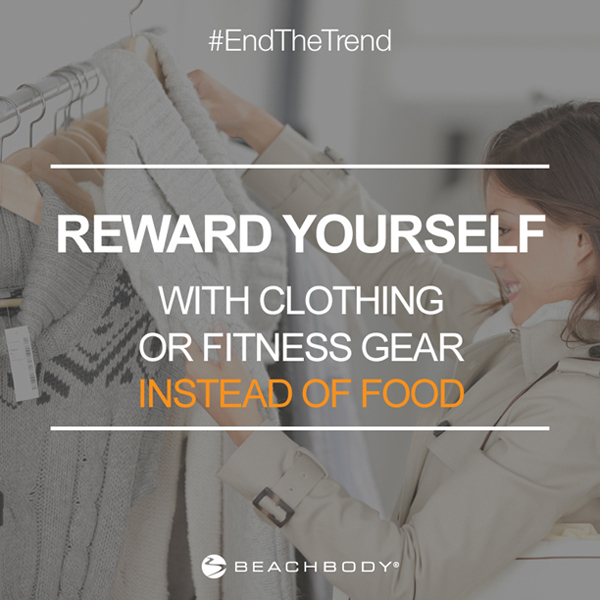 Reward yourself with clothing or new fitness gear when you hit a milestone to give yourself something to look forward to and to train your brain to stop rewarding your body with food. Cooking? 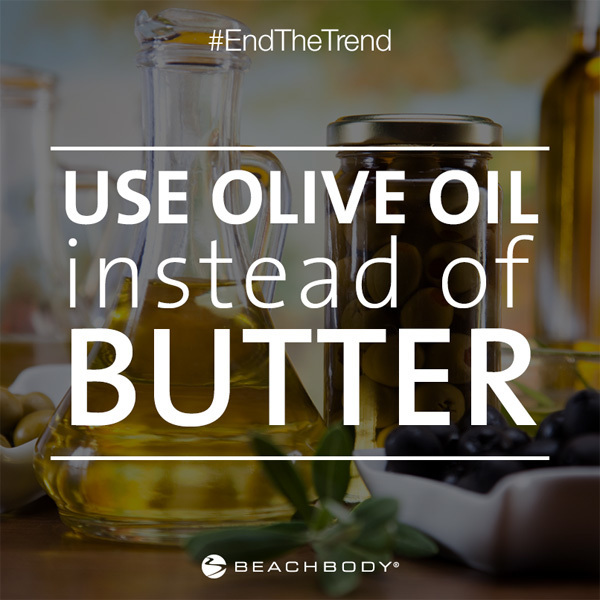 Use light olive oil instead of butter. Why not extra virgin? When cooking over high heat, extra virgin’s lower smoke point can cause it to break down into dangerous byproducts. 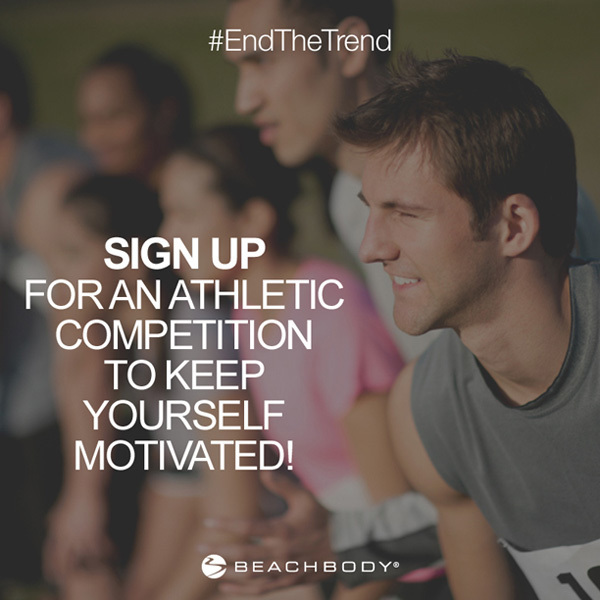 Sign up for an athletic competition to keep yourself motivated. If your goal is “getting in shape,” it’s easy to lose steam! But, if you know you have to get—or stay—fit for an upcoming race, you’re more likely to stick with your workouts. 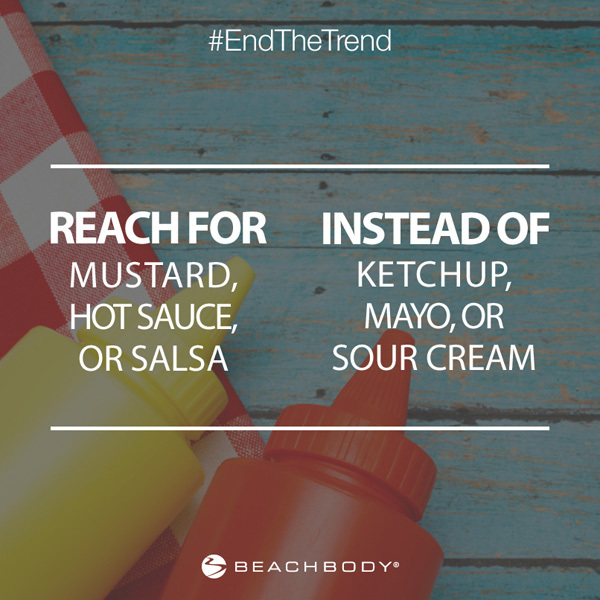 Reach for mustard, hot sauce, and salsa instead of ketchup, mayo, or sour cream. Why? The former have fewer calories, more nutrients, and usually less sugar. 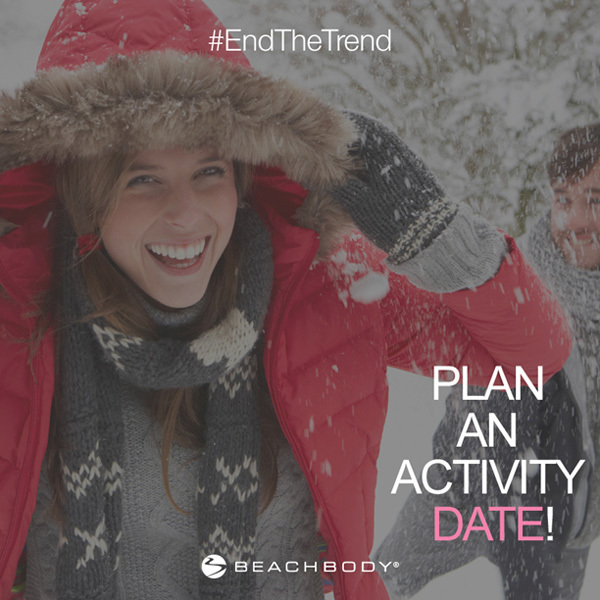 Plan a fun activity date, like a snowball fight, a hike, or a game of tennis. Why? Novel activities and laughter are two proven ways to strengthen the bond between you and your partner. 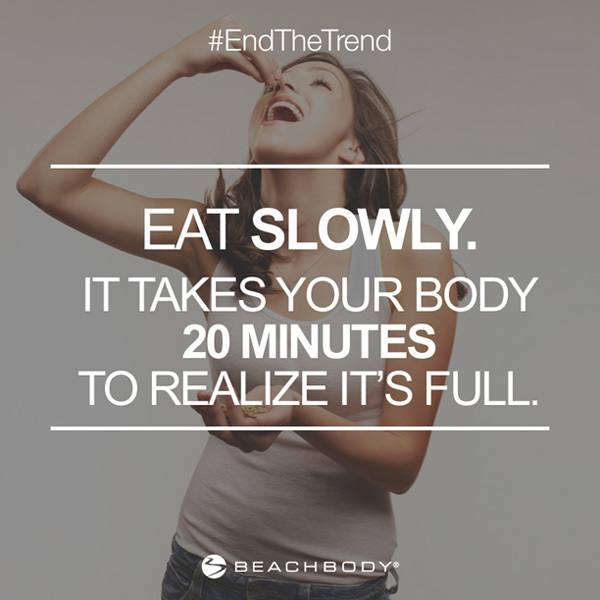 Eat slowly. It takes your body 20 minutes to realize it’s full. By eating slower, you’re less likely to overeat. Get some Zs! 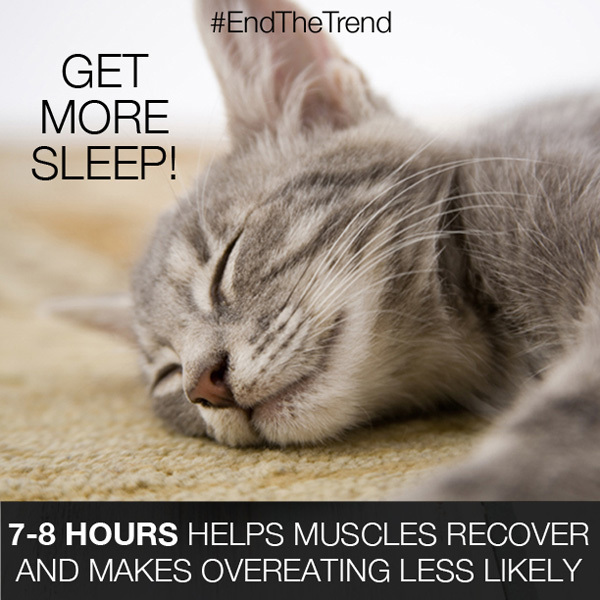 Getting 7 to 8 hours of sleep helps muscles recover faster, the brain work better, and makes you less likely to overeat. 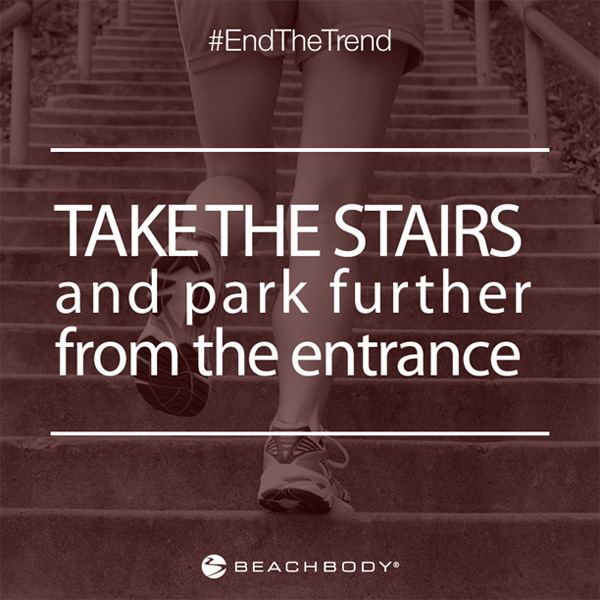 Take the stairs! Park farther from the entrance! The less time you spend sitting, the better it is for your body. And, if you’re trying to lose weight, every little bit counts! A review of research from the past 50 years revels a link of gluten to chronic disease. It is now accepted that gluten sensitivity can affect body wide functions. Intake of gluten may impact body function and lead to chronic diseases. Most patients who present with neurological or other organ manifestations of gluten sensitivity have no gastrointestinal symptoms. Gluten could affect you or someone you love. Empower your health with Dr. Laura M. Brown, ND. Complimentary education talk at Goodness Me! It’s January! Time to dust off those sneakers and dive in to that fitness routine so you can ditch those holiday pounds and get down to your goal weight. Whether you’re following a routine for the first time (or for the first time in a long time) or just refocusing your efforts in the New Year, here are some of my favorite tips on what to keep in mind as you get started. These tips will help you stick with it when you’re feeling grumpy or tired or frustrated or hungry. Do: Before you start, log your weight, your measurements, and take your photos. Don’t: Freak out over what you see. No one likes his or her Day 1 photos or measurements. But, by capturing all of the basic information (how much you weigh, how big your waist is, what you look like shirtless or in a bikini), you’ll establish a starting place. Then, when you take down all this information again (we usually recommend taking them every 30 days, unless you’re doing the 21 Day Fix), you’ll see how much you’ve changed. “I can’t tell you how many times one of our Success Stories has told me that their ‘before’ picture on the fridge saved them at some point along the way,” says Steve Edwards, Beachbody’s VP of Fitness & Nutrition. Full disclosure – I break this rule. I weigh myself every morning just after I wake up. I don’t recommend it, but helps me stay on track. Your weight can fluctuate every day based on how much sodium you consumed the day before, how much you sweated during your workout, whether you went to the bathroom, what time of the month it is, etc. If you’re the type who could get discouraged from seeing your weight go up a pound or two (or more) in 24 hours, then I recommend weighing in approximately the same time each week. 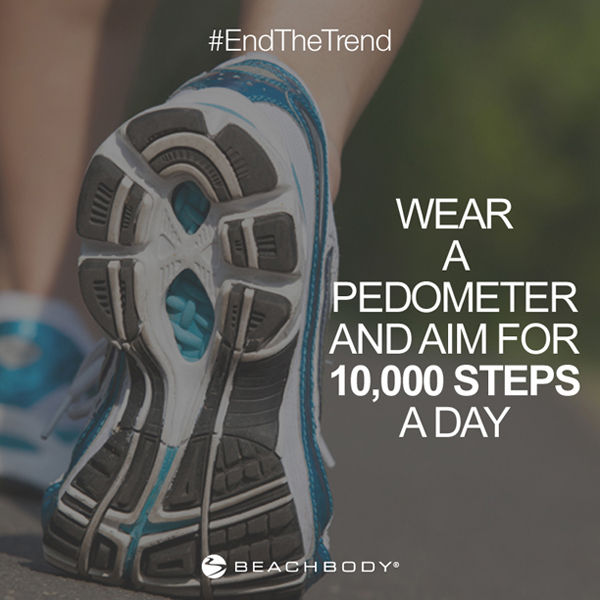 It’ll give you a better overall sense of the trend your weight is heading in. Just keep in mind you might gain a few pounds during the first few weeks of beginning a program. We explain why – and when you should see the numbers drop – here. If you really want to be miserable and set yourself up for failure, cut out everything you like to eat. If your diet is really bad, a lot of stuff you like might have to go. Soda, fried food, super sugary coffee drinks…Think of this new journey as a boot camp. You’re training for the body you’ve always wanted. So feed that body with the food it needs. Lean proteins, complex carbs, and lots of nutrient-packed vegetables. We have tons of healthy recipes on this blog that will fit your new lifestyle. 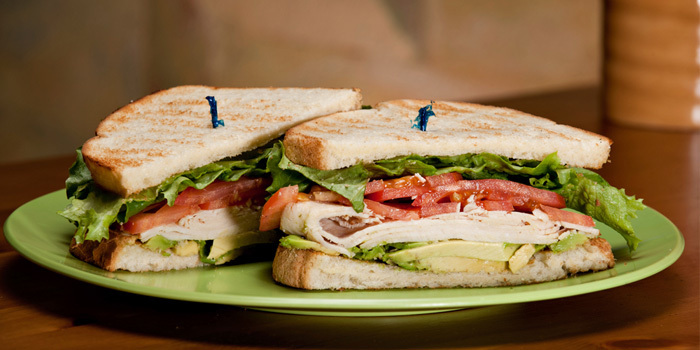 We even have healthier version of some of your favorite foods, including pizza, fries, and burgers. 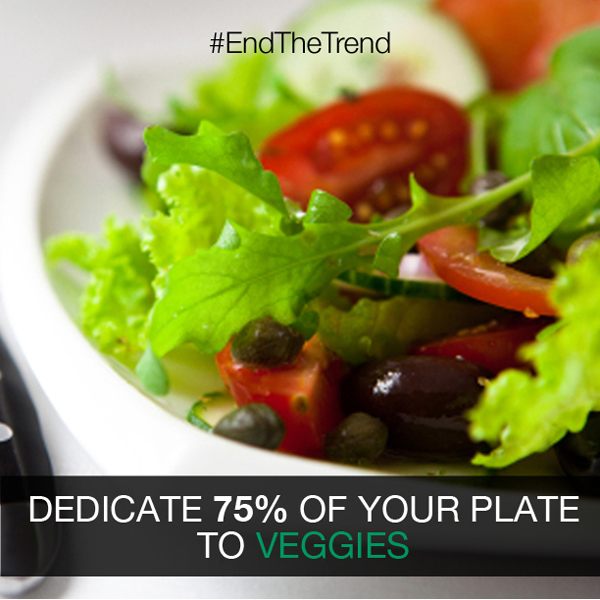 Think about your diet as an 80/20 split. 80% of the time, eat “clean.” The other 20% of the time, don’t stress about it. If you really want that beer or that cookie, have it. One cookie or one beer, isn’t going to be your downfall. Here’s an easy-to-follow article on how to change your diet over 8 weeks, cheat meals included. Don’t: Wait until the day of to figure it out. By planning your meals, like one of our social media ambassadors, Amanda Meixner (@meowmeix) does every week, you make it easier to eat healthier because you don’t have to think about it every day. You just grab your breakfast and/or your lunch and go. We’re going to start posting her meal plan photos each Monday to keep you inspired. Whenever I start a new fitness program, I assume I’m going to be sore for the first two weeks. Even if the soreness doesn’t last that long, it helps my mind get in the right zone. “Soreness is a right of passage, but it’s still difficult to deal with,” says Edwards. “Don’t go 100% on day one, and ramp things up each day based on how you feel. If you do get sore, back off but don’t stop. Doing a workout at 50% is a lot better than nothing. It will also help your soreness fade quicker.” Here are some great tips on how to avoid soreness. Do: Expect to be a little hungry and maybe a little grumpy in the beginning. Don’t: Fall back into old bad habits. Don’t: Don’t wait until Monday to start again if you miss a workout. If you missed a workout because of sickness or travel or you just didn’t feel like doing it, don’t worry. Just get back to it. Not sure where to pick back up? This article will tell you. Do: Get back on program if you fall off. Don’t: Don’t beat yourself up, feel like you’ve failed, or wait until the next day/week/month to start over. No one is perfect. Not me, not you, and not our trainers. Everyone has an unhealthy meal sometimes or misses a workout. Don’t let that define your day, your week, or your month. Justget right back on track. You’re on a journey and along the way, there are going to be a few misses. If you pick yourself right back up and keep going, you’ll get there. Don’t: Listen to the haters. If you share what you’re doing with those around you, there’s a greater likelihood you’ll succeed because you’re creating a social support system that you’re accountable to. There might be people who pooh-pooh your journey, but ignore them. They have their reasons for doing so (usually the reasons stem from jealousy or fear), so just stay positive and reach out to your support system when you need help. We’re here for you, so don’t hesitate to reach out! Here’s where to get even more support during your journey. • If you have questions for our fitness and nutrition experts, post them here in the expert forums, and they’ll answer them. • If you need more peer support, Beachbody’s social channels on Facebook, Twitter, Instagram, and the Team Beachbody message boards are great places to start. • If you have a general question you’d like to see answered in our blog, email us at mailbag@beachbody.com. •If you need a little extra motivation that day, tag me in your photo on Instagram (I’m @r_swanner). Good luck and I can’t wait to see your after photos!